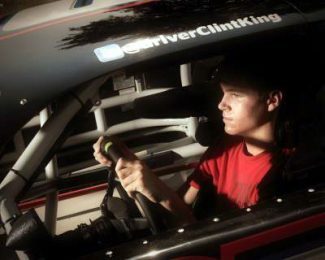 Thomasville, N.C. – In 2011 and 2012 Clint King got a taste of what it was like for “work” to consist of wheeling a full-size heavy stock car in the ARCA Series. Racing for Venturini Motorsports, Clint showed he belonged by running up front consistently and finishing in the top three several times. After spending the majority of the 2013 season building a Lucas Oil Products distributorship (naming it King Oil Products), the now 18-year-old has undertaken another building project for 2014. Clint King Motorsports has acquired three NASCAR K&N Pro Series East machines and motors to go with them in preparation for an all-out assault on the regional touring series next year with plans to have all personnel in place and be ready to go for the New Smyrna/Daytona doubleheader in February. RaceChaser Senior Editor Tom Baker caught up with Clint at the recent CARS race show in Charlotte and got some early insight into what’s going on in the CKM race shop this Holiday season. You can listen in by clicking the link below! Great interview CLINT! Our family wishes you the best in the upcoming year! !